For more than 30 years, TheCapitol.Net and its predecessor, Congressional Quarterly Executive Conferences, have been teaching professionals from government, military, business, and NGOs about the dynamics and operations of the legislative and executive branches and how to work with them. Our courses and publications include congressional operations, legislative and budget process, communication and advocacy, media and public relations, research, preparing and delivering testimony, and more. We have designed and delivered hundreds of custom programs covering congressional/legislative operations, budget process, media training, writing skills, legislative drafting, advocacy, research, testifying before Congress, grassroots, and more. We provide training materials and publications that show how Washington works. Our publications are designed both as course materials and as invaluable reference tools. More than 150 faculty members provide independent subject matter expertise. Each program is designed using the best faculty member for each session. TheCapitol.Net also serves as a subcontractor for prime contractors. Custom training programs are designed to meet your educational and training goals. Each session is led by an independent subject-matter expert best qualified to help you reach your educational objectives and align with your audience. Custom training can help new employees quickly fit into any Washington operation. As part of your custom program, we can also provide classroom and meeting space, breaks and meals, receptions, tours, and registration and individual attendee billing services. Businesses, associations, agencies and military organizations rely on TheCapitol.Net to keep their staff highly effective and aware in the dynamic Washington environment. Our popular Capitol Hill Workshop and budget training sessions ensure clients stay at the cutting edge at all times. Associations and coalitions also rely on us to increase the effectiveness of their annual Capitol Hill Day programs. Our customized course materials serve as an invaluable reference delivering ongoing value. Course materials can include the Congressional Deskbook, Media Relations Handbook, Real World Research Skills, Legislative Drafter's Deskbook, Testifying Before Congress, Lobbying and Advocacy, Persuading Congress, and the Congressional Directory--among others. Continuing Education Units (CEUs) from George Mason University are available upon request for many of our custom training programs. See our Sample Agendas for a few examples of programs tailored for our custom, on-site clients, and see what our clients' staff and members say about our custom on-site training. Would you like to discuss the many ways TheCapitol.Net custom training services can increase the effectiveness of your organization? Please contact us. If you'd like to review our information for Government agencies, please click here. 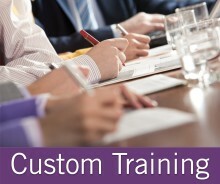 Please see our extensive FAQs About Our Custom, On-Site Training. "A seminar from TheCapitol.Net is one of the best ways to learn from the experts about how Washington really works."